Dawn demonstrating a choke from behind on Melissa properly using her inner forearm bone as a tool against the lower "wind pipe". Dawn is also in close and tight preventing Melissa from getting a hand inside the choke. ---taking big fella Robert down with a Hosin Jitsu move. 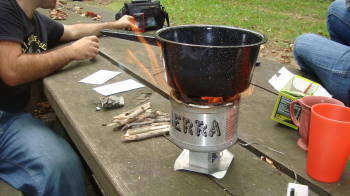 Field exercise: Cooking on a back pack mini wood stove. 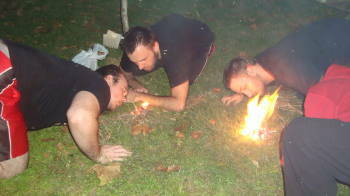 #1 Craig (guest/local friend) making a quick emergency stove with a chainsaw according to our field class insructions. 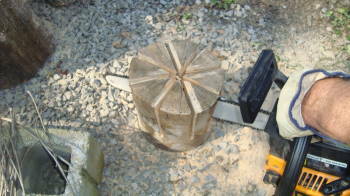 #2 The center of the log is lit with small twigs. 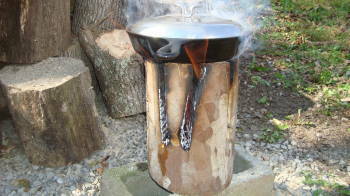 #3 This nifty stove will cook a large meal easily. 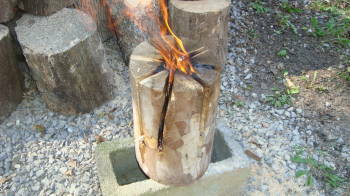 The actual "burn time" from a 10inch diameter log x 18 inches long will result in about an hour of cooking usage. 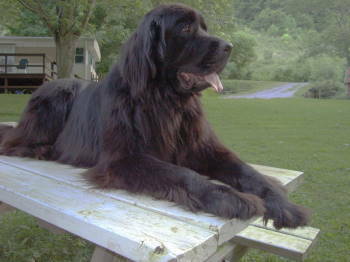 "Bigfoot" (150 lb. 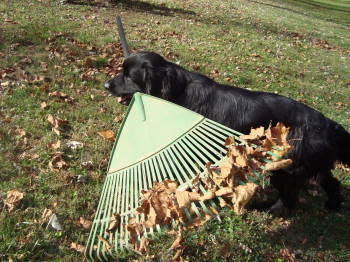 Newfoundland) Always looking to help. 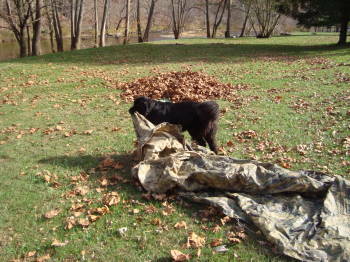 "Let's see -- tarp goes by leaf pile -- people rake 'em up"
"Camping tonight. Let's make room for the tents"
A few of the team headed on a trail hike. 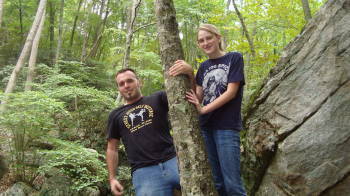 Derik and Melissa hanging on a rock cliff tree. 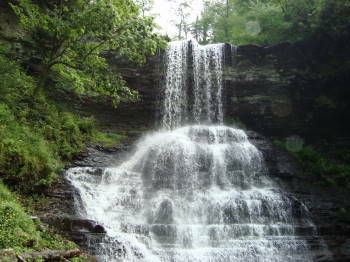 After a 2 mile uphill hike, this 70' water fall appears. 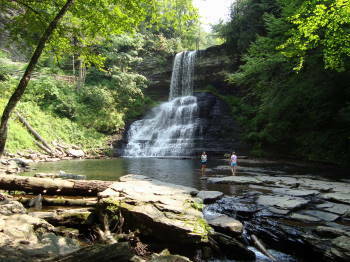 At the base of the Falls is a 30' deep swimming hole. Class instructional "demo-photo" from our blue belt level kickboxing drills. 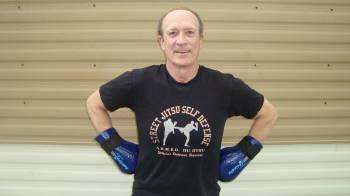 Our sidekicks are ITF TKD heel strikes. 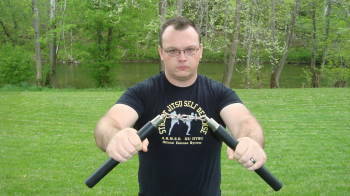 We stress a linear line of attack (as above) for our street oriented self defense lessons. Note the "pressed out heel" for the A.R.M.E.D. sidekick. 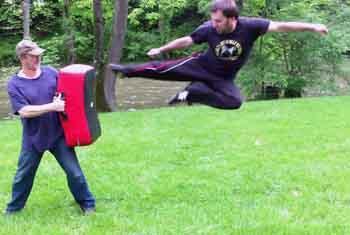 Derik delivers a circular tornado kick to Ken during a sparring session. 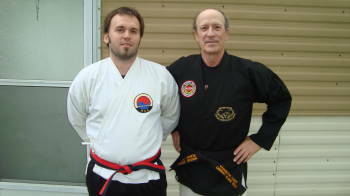 This is cross-training in other styles that have effective circular moves such as the Hapkido related schools of application. #1 Melissa being super careful but aggressive against a knife weilding assailant. 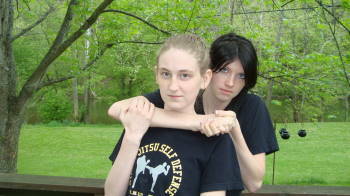 #2 Taking control with a Hosin Jitsu wrist lock above the knife/hand. #3 Note that her eyes do not leave her "target" as Melissa spins clockwise raising the opponent's arm. Speed, confidence, and repetitive practice are what is necessary. Derik executing a picture perfect flying side kick. 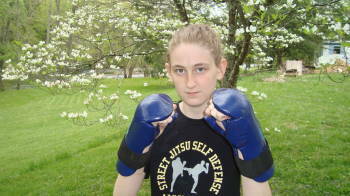 #4 Continuing with proper momentum, the attacker's knife arm winds up over her shoulder for an elbow joint break. 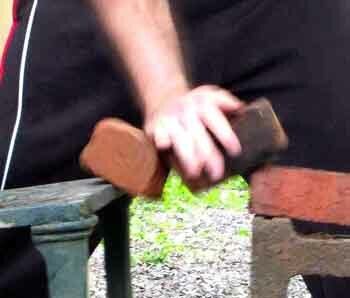 Also, Derik giving a power hand break demonstration driving through a solid red house brick (no holes type). 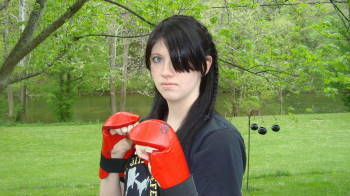 Yes, we do train in Karate forged hand styles too. 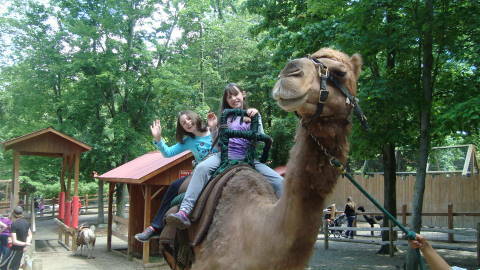 McKenna (back seat) and Aly, on a nature day trip riding a camel. More class photos will be uploaded in the future with more students' pics . Thanks to all ! 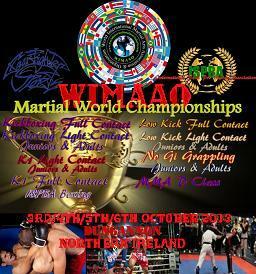 PS: Open World Championship matches in varying styles and weight classes of our international membership club WIMAAO will be held in Dungannon, Northern Ireland, October 3,4,5,6. Qualified A.R.M.E.D. students (present or future) have an opened invitation from the WIMAAO for competition to test skills and endurance in either full contact or light contact events. Matches in America and Canada will be announced on our web site here and by email. As class students, it is not mandatory to compete to attend the events as a local club member and spectator. 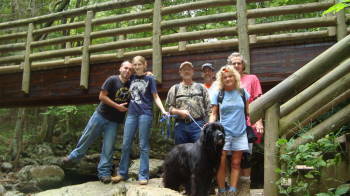 Plan to take a class trip with us in the future. The Pearisburg Virginia A.R.M.E.D. instructional program operates independently of the WIMAAO and is guided soley by our private enrollment policies. Contact a class student or instructor for sign up.